Saturday mornings are magical for me. Partly, because I get an extra hour of sleep and I am excited to spend the day with my family but mostly because I get to cook my favorite meal- Breakfast! For me, breakfast is a meal that says “I love you”. If you have ever spent hours making pancakes in the morning for your family you know what I’m talking about, it’s truly a labor of love. There is just something so satisfying to me about making my family breakfast. One of my favorite, no, my FAVORITE breakfast is omelets. When I was little my Dad and I would make omelets together on Saturday mornings. It was our special time together. I remember there being very specific instructions to make omelets. My Dad said every ingredient had to be cooked separately to maintain it’s flavor. (Maybe that’s where I learned to use EVERY dish in the house for a single meal? lol) We used bell pepper, onions, a meat (ham, bacon, sausage) tomatoes and cheese. They were perfect. I don’t always follow “the rules” anymore, but I still remember them and cherish those memories every time I make omelets- it’s part of the magic. 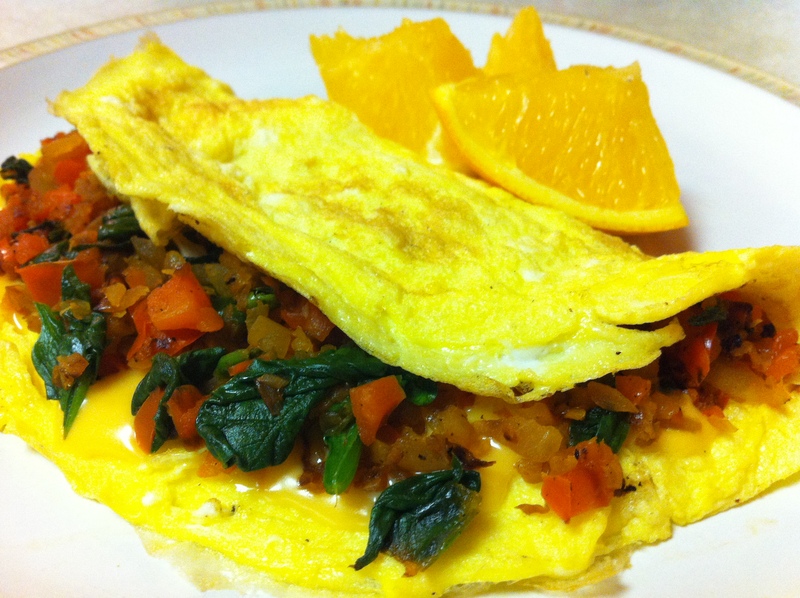 This week I made veggie omelets- doesn’t follow the rules but is a big hit in my house! 5. Spray small pan with cooking spray and let the pan warm on the burner. When you put a drop of egg on the pan and it cooks immediately you are ready to start. 6. Add half of the eggs to the pan and cook until the the consistency of the egg on top is thick, not runny and the bottom of the egg is completely cooked. 7.Carefully flip the omelet over. Arrange one piece of cheese on one half of the omelet. Cover with half of your vegetable mixture, sprinkle on half of tomatoes. Fold the other side over and slide onto a plate. Repeat steps 5-7 to make the second omelet. You can change the rules to make this one of your family’s favorites too- Don’t worry, I won’t tell Dad 🙂 or spend time together making another family favorite for breakfast. Remember- you’re making more than breakfast- you’re making memories, you’re making magical mornings!